Teenage Student Gets Death Threats After Calling Out Trump Death Threat in a Quiz — Condition Yellow: Stay Alert. Stay Alive. 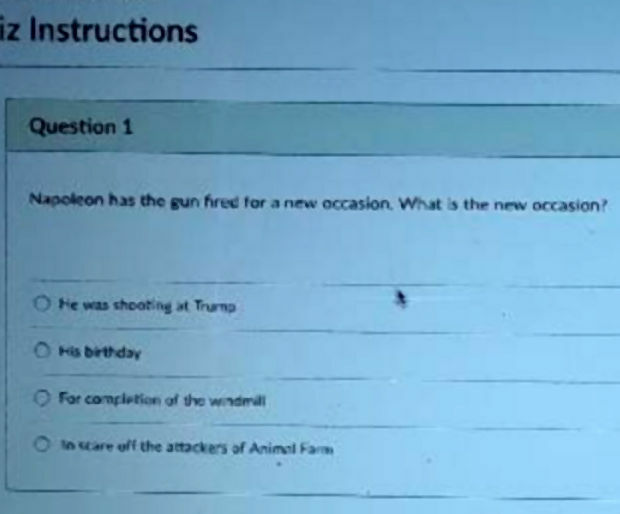 The multiple-choice question asked about one of the events in the book, in which a character named Napoleon has a "gun fired for a new occasion." The question asks students what the new occasion was. The first suggested answer is "He was shooting at Trump." TCSD #1 administration learned late yesterday that a quiz was administered to a class of high school students that contained an inappropriate answer to a multiple choice question. Administration is investigating this incident and verifying the information we have received. Jackson Hole High School administrators took action as well -- not so much to protect the 16-year-old student as he received death threats for daring to support his President, but more to protect the staff members responsible. Teton County School District No. 1, which previously confirmed the quiz was administered Thursday in Aufderheide’s sophomore English class, will not say who wrote it. This is what our education system has become -- a dumping ground for political vitriol, protected by leftist power and infested with poisonous 'educators' seeking to brainwash America's youth with hateful ideologies. McCollum told me his 16-year-old son is a big Trump supporter. His son is considering enlisting in the Marines after high school — and Trump’s position on the military was a key factor. Should this young man enlist, he'll now know first-hand exactly what kind of America he's defending.